The Worst Interviewer in the World? CUOMO: All right, so first we have a credibility attack and then an attack on the facts. What is your response to the president of the United States saying you should not be believed because you misrepresented your military record in the past? Not a particularly pointed question (note how Cuomo separates himself from the uncomfortable fact of Blumenthal’s dishonesty by out-sourcing the issue to Trump) but at least he asked it. Whereupon the Senator simply ignores Cuomo’s question and gives a pre-scripted answer. A competent interviewer (like Jake Tapper) wouldn’t let him get away with that, but Cuomo–whether for lack of competence, or just to protect a fellow Democrat–gives the Senator a total pass and promptly drops the issue. That’s a pretty poor job of interviewing, but The Cable Gamer has seen worse. In fact, what she saw yesterday may just go into the record books. To say Andrew Sullivan has credibility issues is like saying you might find sand in the Sahara. For years he has promoted a daft conspiracy theory involving Sarah Palin’s son Trig: that she faked her 2008 pregnancy to cover up for the fact that he was actually Bristol’s child. Even Donald Trump faced facts and abandoned his birtherism, but Andrew Sullivan seems reluctant to let his go. And yet here he is, on Reliable Sources (yes, the irony is thick), to proclaim it’s Trump who’s the “unstable” one. SULLIVAN: …And he’s [Trump] able to command his underlings to actually go out there and say things that are empirically untrue. 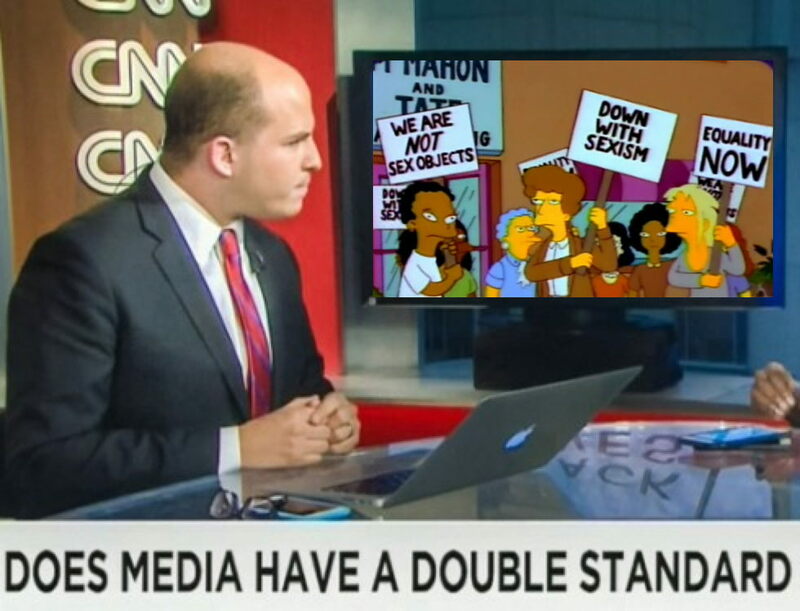 STELTER: You said unstable. In your column you said mentally unstable. Why do you think it’s appropriate to be describing the president that way? SULLIVAN: I’m not a shrink, and if I were, I wouldn’t say this, anyway, because you can’t diagnose someone. But I’m a human being, and I can tell if someone is saying things that we know not to be true and never corrects it. STELTER: But you’re taking it a couple of steps further by questioning his mental stability. And I wonder why you think that’s not been said more often on television or in columns like your own. SULLIVAN: I think sometimes you want to assume that there is a rationality at the center of our entire republic. That there is someone who can listen to reason, who see an empirical fact, who can distinguish between an opinion and a fact, between what he wants to be true and what is true. SULLIVAN: He won’t correct anything. In fact, I don’t think of all the hundreds and hundreds of false statements he’s made, he and his spokesman have not actually retracted a single one. SULLIVAN: But at some point, being a writer or a journalist requires one to simply say what one is seeing in front of one’s eyes. SULLIVAN: If you continually do that and you never recognize reality…it is, to put it frankly, a little bonkers. SULLIVAN: We have to relate it to reality at some point, our interpretation of reality. STELTER: Andrew Sullivan, thank you so much for being here this morning. SULLIVAN: You’re so welcome, Brian. There are grade-school newsletters whose interns could conduct a better interview than this. The Cable Gamer sees two possible explanations. Either Brian Stelter is a partisan hack, as far left as his twitter feed suggests, who has ceased being a media reporter to function as a propagandist. Or he really is the worst interviewer in the world. I don’t mind Brian Stelter as an interviewer. He often asked more probing questions than his counterpart at Fox News — Howard Kurtz. Is Townhall Promoting Fake Megyn Kelly News…and a Scam?